This event is part of the Centre for Transcultural Writing and Research’s Writing for Liberty series. It is presented in partnership with LitFest, and has been made possible by the generous support of the Lancaster University Friends Fund. There will be a bookstall and refreshments will be provided. She is the author of twelve novels. Her 2000 work, Red Dust, a courtroom drama that explores the meanings and effects of the South African Truth and Reconciliation Commission, was made into a film released in 2004 directed by Tom Hooper and starring Hilary Swank, Chiwetel Ejiofor and Jamie Bartlett. 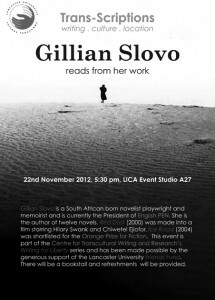 Her 2004 work Ice Road was shortlisted for the Orange Prize for Fiction. The novel incorporates real events (the death of Sergey Kirov) with a fictionalised rendering of life during the Siege of Leningrad. 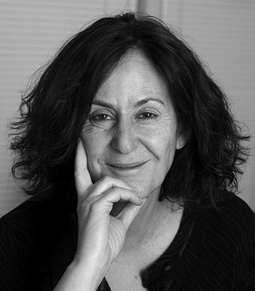 Her 1997 memoir, Every Secret Thing: My Family, My Country, is an account of her childhood in South Africa and her relationship with her parents Joe Slovo and Ruth First — both famous South Africans and major figures in the anti-apartheid struggle who lived perilous lives of exile, armed resistance, and occasional imprisonment, which culminated in her mother’s murder by South African forces in 1982. Gillian has also compiled two verbatim plays: Guantanamo: Honor Bound to Defend Freedom which started in Kilburn’s Tricycle Theatre before transferring to the west end and playing worldwide and The Riots which played to sold out audiences in the Tricycle and then Tottenham’s Bernie Grant Arts Centre. She also compiled the verbatim section of the Tricycle’s Women, Power and Politics section.